Bravery doesn’t always involve risking your life for someone else. Sometimes it is taking a risk for yourself – a risk that could result in experiencing a better life. It’s stepping outside your comfort zone. I recently met some incredibly brave women. We only spent a weekend together, but we will forever be connected. Who are these brave women? They are the participants of our first Motherless Daughters Journey Retreat. These women, all different ages and from different backgrounds, chose to spend the weekend with a group of women they never met. Some of them even traveled great distances. They all chose to share their stories and were vulnerable about the heartache that comes with mother loss. 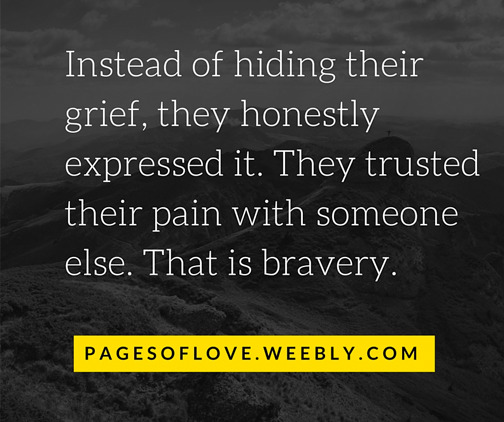 Instead of hiding their grief, they honestly expressed it. They trusted their pain with someone else. That is bravery. These women quickly bonded with each other. They not only cried together, but laughed, supported, and encouraged one another. It was incredible to see the healing that took place. It was such an honor and privilege to be one of the facilitators at the Journey Retreat. It’s humbling to think that God would allow me to be a part of His plan – that He would allow me to walk alongside and support these women. I honestly had doubts and questioned God about facilitating. I questioned my abilities, which ironically was the exact reason I knew I was supposed to facilitate – I couldn’t do it on my own, but I needed to rely on God to equip me and help me. A lot of planning went into the retreat, but so did a lot of prayer. Our group of volunteers prayed for these women before we met them. As a facilitator, I prayed that these women would feel loved, supported, and encouraged, and that God would give them peace, comfort, and hope in the midst of their grief. I also prayed for healing. I expected God to answer those prayers, and He did. What I didn’t expect was for Him to use these women to do all of those things for me. They provided me with love, support, comfort, and encouragement. I felt such peace in their presence, and they gave me hope. God used them to remind me that even though I will have to experience several major life events without my mom, He will put other women in my life to help me through those experiences. It may be hard to face them without my mom, but I won’t have to go through them alone. I saw this lived out in the stories of the women at the retreat, and it was such an encouragement to me. Even though all of our stories are different, mother loss binds us together. There are certain things that only other motherless daughters understand. It’s a group that I never wanted to be a part of, but I’m so thankful for the women I have met along the way. I’m especially thankful for the brave women that I met at the Journey Retreat.